Request: I urge all Twilight fans to please read this but before doing so, switch on your "Sense of Humour" and please don't take it personally. Anybody who knows me fairly well would tell you that I am not a fool. Yet I subjected myself to the phenomenal pre-teen hit movie Twilight. Why I did such unthinkable injustice to myself, in spite of being forewarned, is beyond the scope of this post. 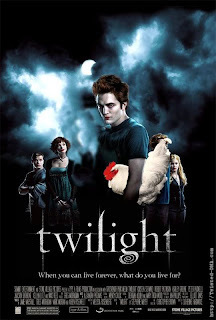 To summarize the storyline, Edward is a 'Greek god'-lookalike vampire who went on one of those low-carb, non-human diets.Along comes the classic dumb heroine, Bella, who is beautiful but doesn’t know it, has everything but brains. To Edward she smells like irresistible food and makes his life miserable. So our 100-year-old vampire eventually falls in love with 17-year-old Bella(Talk about age gap!!). In case I haven’t mentioned it, the director reminds you every other minute that Edward is an awesome personification of awesomeness. Rest of the story is the standard formula. Add forbidden love, a pinch of angst and a villain and shake it. Out pours a regular Bollywood-love story. "I am Edward. I am a Vampire. I used to eat chicken for breakfast, lunch, dinner and when I got hungry in the middle of the night. But I became a vegetarian. I vowed not to eat chicken any more. In fact, I go to school with a flock of chicken and pretend to be a chicken myself. One day, this extraordinary Chicken(Bella) waltzed into my class! It smelled just like Butter Chicken Masala. I was overcome with hunger. It started looking like a barbecued chicken, so enticing, so inviting. But at the same time, I was terribly attracted to it too! I had all these feelings I couldn’t understand. I was confused. Testosterone and hunger fought for control over my body. I wanted to kiss its delicate wing, make sandwich out of it, cuddle it and whisper Chicken-65 recipe softly into its ear. The chicken had an uncontrollable attraction for me too. I tried to persuade her to leave me. I confessed my hunger for her.I explained to her that it won't work out. She wouldn’t relent. She had dreams of marrying me!!!! When the love story between us was cooking, another human laid his eyes on my chicken. He wanted it for a dinner date, where the date becomes dinner. I protected my feathered friend and made it mine. I implored it to leave town, find greener pastures; I didn’t want to clip its wings. But it decided to abandon all its family for a human it knew for about 2 months and stay with me. Now I know why they call it chicken brain. For now we are a happy couple."